Neil Gershenfeld and Russ Tedrake (Director, Center for Robotics, MIT Computer Science and Artificial Intelligence Lab), Sangbae Kim (MIT Biomimetic Robotics Lab), Mick Mountz (Founder, Kiva Systems), Gill Pratt (Program Manager, DARPA Robotics Challenge, DARPA Defense Sciences), Marc Raibert (Founder, Boston Dynamics) and Radhika Nagpal (Self-organizing Systems Research and Robotics Group, Harvard University) answer questions such as: Does the human super-organism model take off in bio-robotics design?, What errors have you encountered IRL and not in simulation of robots? How do you tune your simulation sw to match? 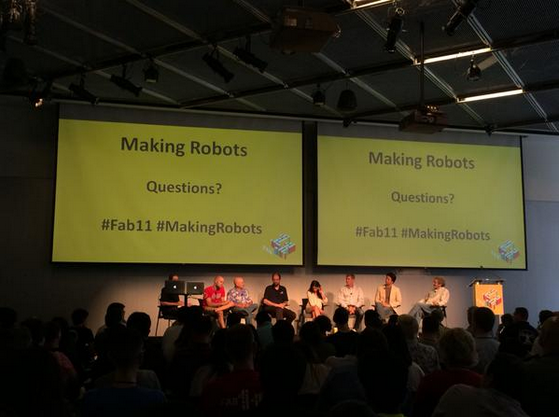 at Fab11.